Valentine’s Day is coming, and I love Valentine’s Day — even when I have no Valentine. This year, I have a houseful of friends who deserve some love-in-a-baked-form from me. This raspberry tart with gluten free pie crust fits the occasion perfectly! I’ve been researching and cooking healthier foods for a long time, and lately have been reading more about an anti-inflammatory diet. So, I decided to make the pie crust from scratch, using quinoa flour. This flour has less carbohydrates and more protein than wheat flour, plus tons of vitamins and minerals (bonus for iron) and is gluten free. Most quinoa-flour bakers recommend using only 25% gluten free flour in breads and baked goods, but since this was going to be a press pie crust (who wants to roll out dough when you can press it into cute heart-shaped pans?) I used 100% quinoa flour. 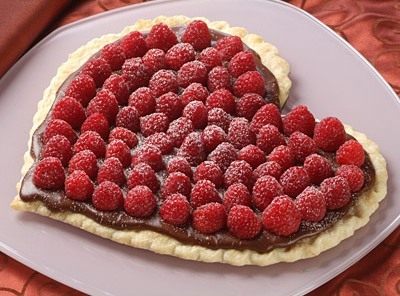 And I wanted to see if a gluten free pie crust would work with this chocolate raspberry tart. Using an easy, basic pie crust recipe from Simply Recipes, I cut the recipe in half since this is a tart (it only needs 1 crust, not 2). After forming the dough into a ball, instead of refrigerating, I divided it into 4 equal parts and simply pressed into 4 small heart pans (these happen to be disposable paper pans). The rest of the tart is fast and easy and oh so pretty. It came out delicious! The gluten free pie crust with quinoa flour was the perfect base for the sweet rich chocolate and red tart berries. And I got to give away some love. Get easy pie crust recipe here (just sub quinoa flour or almost flour as suggested in the recipe).